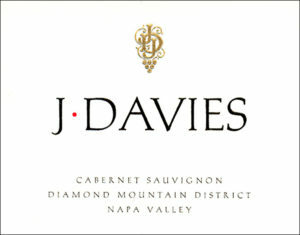 The Davies family, proprietors of Schramsberg Vineyards in Napa Valley, presents its seventh vintage of Cabernet Sauvignon. This wine is produced from the historic Diamond Mountain vineyards purchased in 1965 and replanted to Bordeaux varietals beginning in 1994. The wine is named in honor of patriarch Jack L. Davies, who along with his wife, Jamie, revived the Schramsberg property and established the preeminent American sparkling wine house more than four decades ago. A creation of the next generation of the Davies family, the J. Davies Cabernet Sauvignon is the product of an intimate knowledge of a place and a passion to create a delicious red wine. Layered and evolving, the concentrated boysenberry and blackberry fruit aromas combine with nuances of cocoa, cinnamon and sandalwood. The palate is bold, complex and rich; with wild berry compote and black cherry dancing with touches of vanilla cream and clove. Silky tannins give structure and balance, affording a long and luxurious finish.